Vĩnh Long: bến xe Vĩnh Long điện thoại (070) 387.9777, bến xe Bình Minh (bờ phà Cần Thơ) điện thoại (070) 374.2999. Vĩnh Long: Bến xe Vĩnh Long, 1E Đinh Tiên Hoàng, ĐT (070)3878878. Vĩnh Long City is the capital of Vĩnh Long Province in Southern Vietnam. A sleepy and dusty town, it has recently known as an eco-tourist destination, very popular with day trippers from HCMC. Vĩnh Long Province itself is one of the smaller provinces on the Mekong River Delta with total area of 1480 sq km but it's densely populated, about 1 million inhabitants as of 2010. It lies 130 km southwest of HCMC on the Tiền River (Sông Tiền), one of the two branches of the Mekong River. 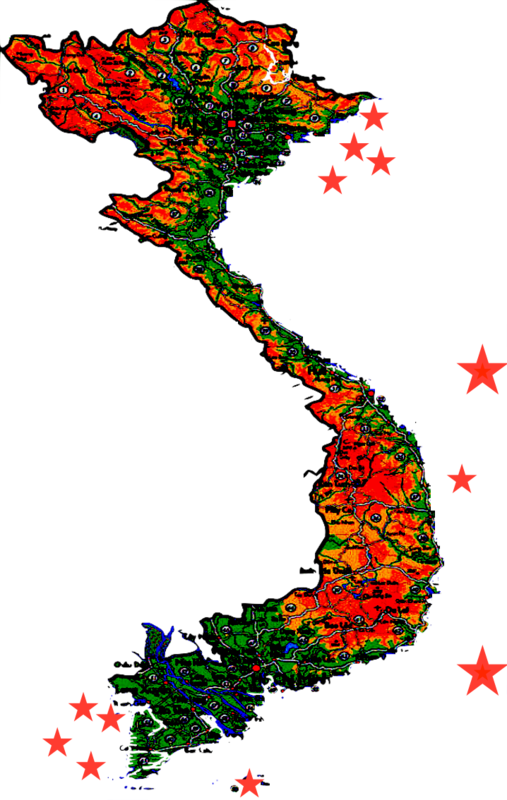 The main ethnic group is Kinh (as 88% of Vietnamese are nationally) but there are also significant number of Cantonese-speaking ethnic Chinese as well as Khmer (ethnic Cambodians). Vĩnh Long contributes to the nation's history as part of the historic settlement of the Mekong River Delta as Vietnam expanded southward in the 18th and 19th centuries. A large part of its recent past has either been lost or poorly documented and thus, invisible to tourists, and to an extent, even ordinary town people. French colonial influence can still be seen in architecture as many old French buildings (now government offices and private residences) are scattered over the city. Chinese influence is strong with many Chinese temples, Chinese-own businesses (e.g. traditional Chinese medicine stores) and southern Chinese dishes and snacks. Many beautiful and serene Buddhist temples attribute to its strong Mahayana Buddhist heritage. Vinh Long produces two (Phạm Hùng and Võ văn Kiệt) out of only six prime ministers since 1975, no small achievement for a place very few people have heard of. Vĩnh Long City has two bus stations: the main one (Bến Xe Lớn) about 4 km from town for long-distance buses and a smaller one in the center, just about 3 blocks from river bank and 1 block from the main market. The smaller bus station takes you to neighboring Cần Thơ City (Cần Thơ Province) and suburban/rural districts of Vĩnh Long Province. Long-distance buses from Ho Chi Minh City, en route to other Western provinces (Can Tho, Bac Lieu, Ca Mau), drop you off at the main bus station . From there, the bus companies (currently including Phuong Trang and Mai Linh) give passengers a ride to any destinations within the city limit for FREE. The shuttle ride is included in the bus fare. If you would like to ride with a motorbike taxi, you should not pay more than 2-3 USD for a ride to a hotel in the center of town or to the boat quay on the Tien River (Bến Đò Sông Tiền) for your eco-tour or home stay on An Binh Island. Ferry to An Binh Island costs 500 Dong for pedestrians and up to 2,500 Dong for motorists, running every 10-15 minutes. Motorbike taxi: cheap and plentiful but quite an experience if you never ride one before. Prices vary according to who you are; tourists usually pay a bit more than locals. Pay 20-40 cents for every km or mile is more than enough to compensate your driver. Chùa Thiên Hậu (Thien Hau Temple), a Chinese temple (a national historic landmark), on An Bình Island, a few minutes of walking from the ferry jetty. Văn Thánh Miếu (Temple of Literature), about 2 km out of town on Trần Phú Street. Cù lao An Bình (An Binh Island) on the Tien River, across from the city center, crisscrossed by dozens of rivers and creeks, laden with fruit orchards, narrow bike lanes, and tourists resorts. Our hotel advised us to find a boat for a tour at the waterfront at 6am. We found only one boat and booked it for $15 for 3 hours. Our larger boat did not enter the small channels of An Binh island. The Cai Be market was fairly quiet by our arrival at 7:30am. There is Co.Op supermarket near inner bus station. Several places on the island offer what they call homestays. These may not be in actual local people's homes, but still in traditional-style houses right in the countryside. One of them is Green Island Tour (070 3859908), offering an overnight stay including a large dinner consisting of many different dishes, breakfast and a bicycle for US$10. It's excellent value considering the dinner alone would cost almost the same in any restaurant. A moto from the bus station can take you here for 50,000 dong including the ferry ride. From Vinh Long back to Ho Chi Minh City, there are at least 5 bus lines as of 2013; they're all located in different parts of town. Mai Linh and Phuong Trang are at the main bus station (i.e. Bến Xe Lớn) on the edge of town. Your hotel can reserve seats on the bus with a simple phone call or you can show up at the bus station on your own 30 minutes before departure and hope that they'll have seats available. Buses run every hour from early morning until night. If one company doesn't have seats, just walk to the other next door. For your convenience, all bus companies will pick you up anywhere in town and take you to the station waiting for the departure for free. The fare as of 2013 is about 4 USD and will likely go up in the future. The bus companies will drop you off at the Western Province Station (Bến xe miền Tây) in the suburb of HCMC. From there, you can ride the FREE shuttle bus to their transit centers (trạm truân chuyển) usually District 5. Once you're there, it's a cheap taxi ride to any hotels in the city center. This involves getting on and off the bus a lot but it saves you money as most passengers on your bus will do the same thing. If you're heading to Ben Tre, take yourself to the ferry crossing 4km east of town, (40,000 taxi ride) cross the Mekong on the car ferry (1,000 dong/person), walk 100m and take the No 8 local bus (at least hourly) to Ben Tre (19,000 dong/person in May 2016). This drives through central Ben Tre before arriving at the outer bus station. For Western provinces (tỉnh miền Tây) such as neighboring Cần Thơ or further away provinces such as Cà Mau (for Cape Cà Mau--the westernmost point of Vietnam) or the Cape if National Forest), Bạc Liêu, Kiên Giang (for Phú Quốc Island or Hà Tiên), An Giang (for Cambodia border crossing), go to from the main bus station (Bến Xe Lớn) and catch one of the west-bound buses en route from HCMC. Buses run frequently (every hour); some are even equipped with lie-flat reclining seats for comfort and these cost a bit more. If you just want to neighboring Cần Thơ City and have some luggage or a few people in your party, it may be better to get a taxi because it's faster and more comfortable. The fare may be 20 or 30 USD for about 1 hour trip.